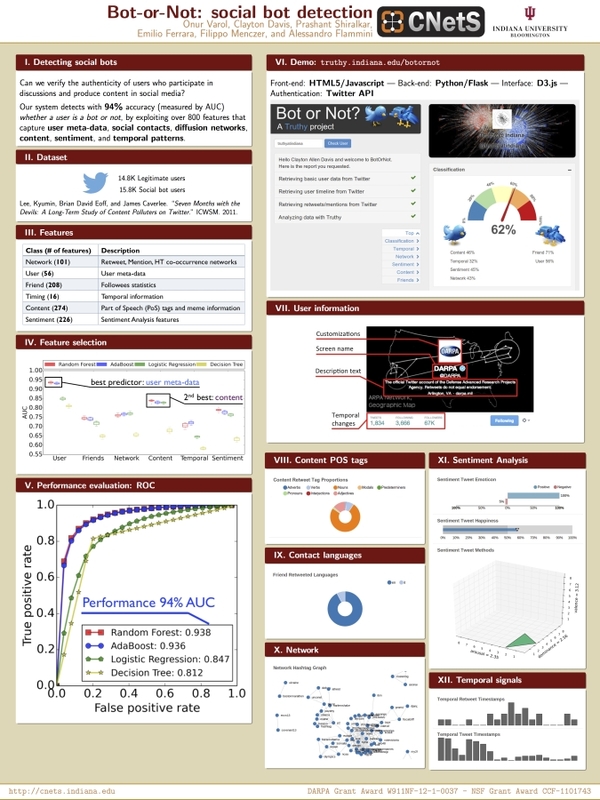 The CNetS poster “The Rise of Social Bots in Online Social Networks” by Emilio Ferrara, Onur Varol, Prashant Shiralkar, Clayton Davis, Filippo Menczer, and Alessandro Flammini won a Best Poster Award at CCS 2015. The poster was presented by Clayton Davis. 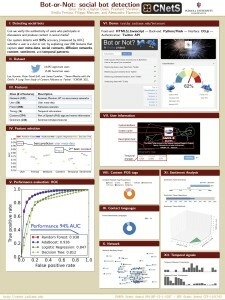 The results will also appear in the paper “The Rise of Social Bots” to be published in Comm. ACM (in press, preprint). The paper “Modularity and the Spread of Perturbations in Complex Dynamical Systems” by Artemy Kolchinsky, Alexander J. Gates and Luis M. Rocha, and the poster “Information Theoretic Structures of the French Revolution” by Alexander Barron, Simon DeDeo and Rebecca Spang won additional awards. Finally, our former postdoctoral scientist Bruno Gonçalves (now tenured faculty member at Aix-Marseille Université) received a Junior Scientist Award from the Complex Systems Society for his contributions to the study of human social behavior from large-scale online attention and behavioral data. This is the second Junior Scientist Award for CNetS (the first was won by Filippo Radicchi). Congratulations to the CNetS team! Simon DeDeo will also deliver one of the plenary talks. *Denotes papers “starred”, or designated as especially worthwhile by the CCS15 program committee. In addition, CNetS researchers presented several papers at the recent NetSci, ICCSS, CAP 2015, CSCW, YTH Live, WWW, and ICCS conferences. Congratulations! Congratulations to Artemy Kolchinsky a brand new PhD in 2015 in the Complex Systems track of the Informatics PhD Program. Artemy’s PhD Dissertation is entittled “Measuring Scales: Integration and Modularity in Complex Systems“. 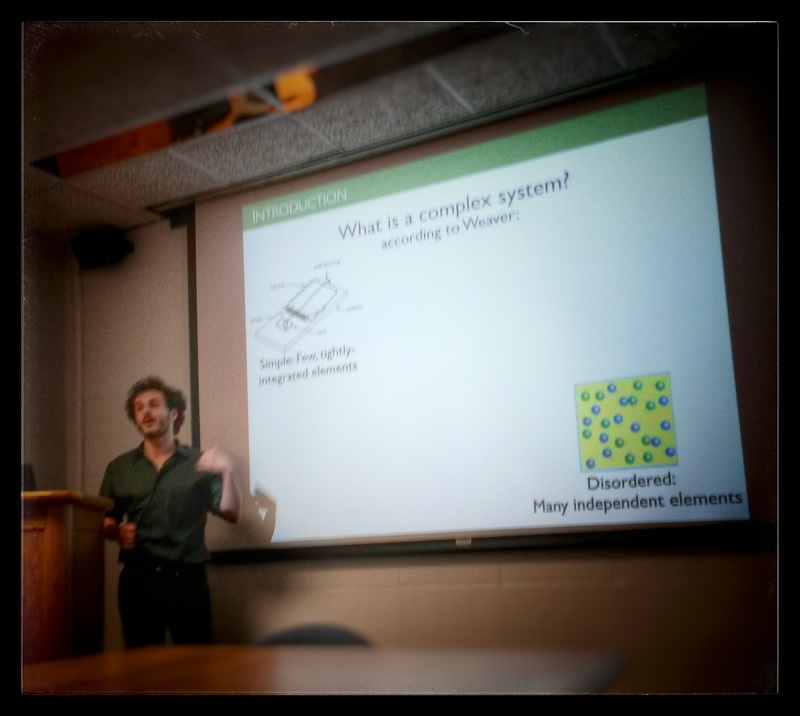 Artemy Kolchinsky Dissertation Defense. April 2015.